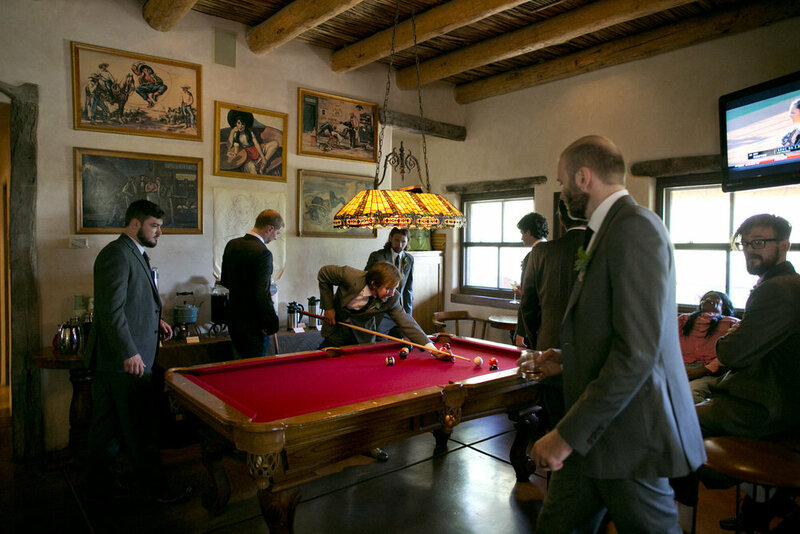 When the Site Director of The Knot.com gets married, you know that you're in for a treat. 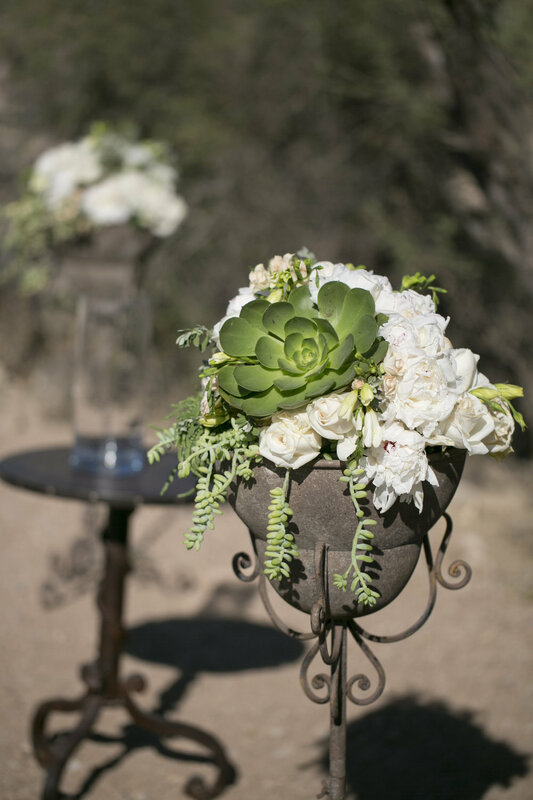 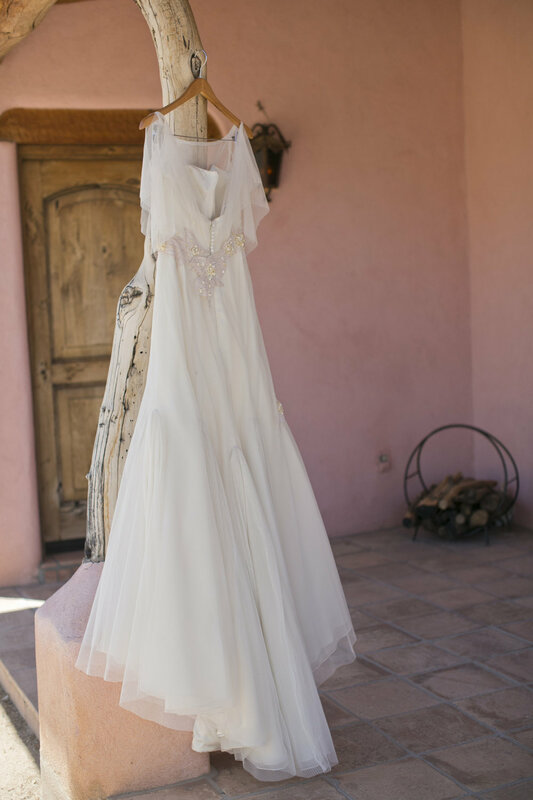 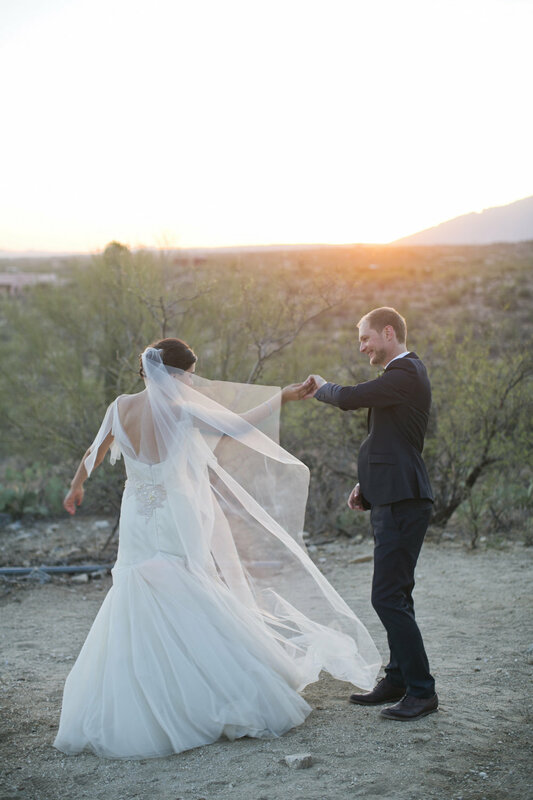 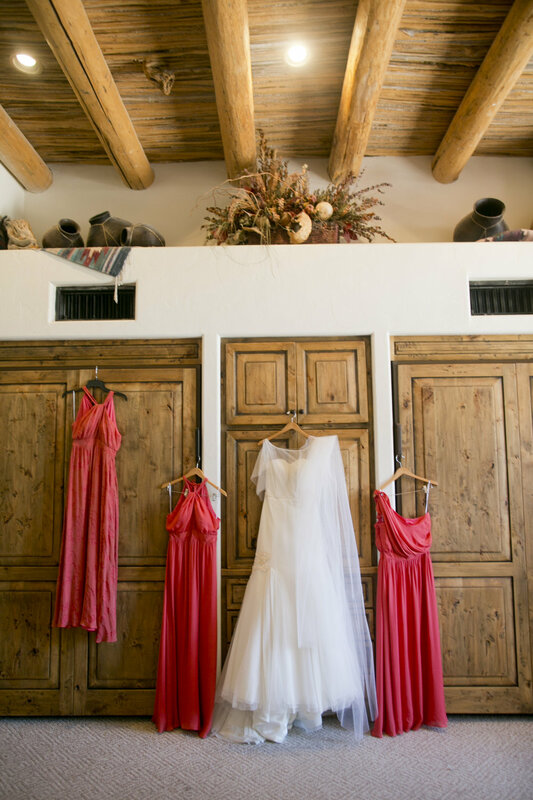 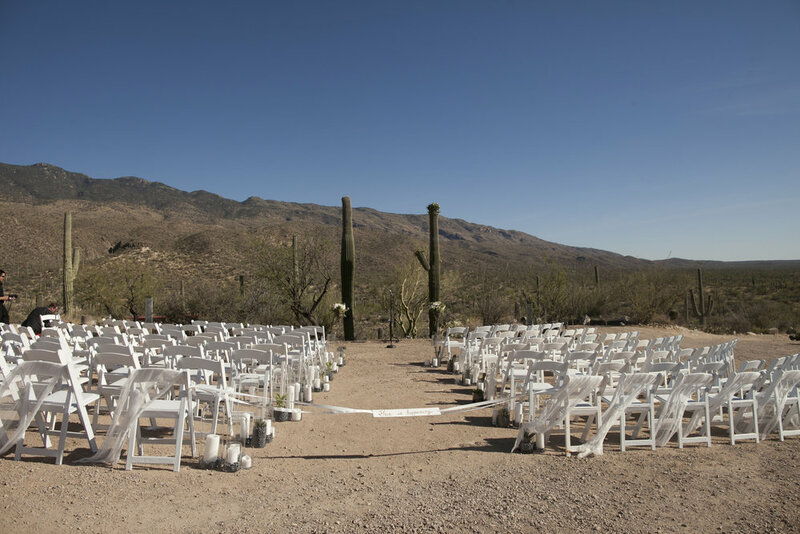 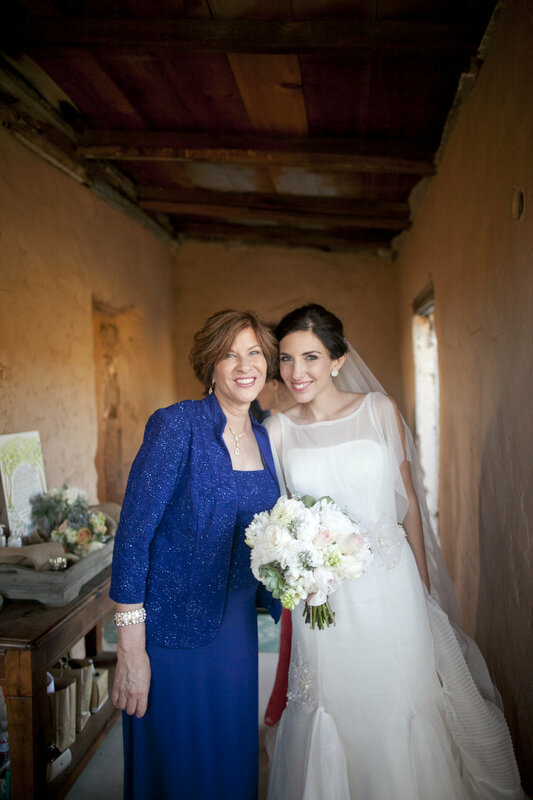 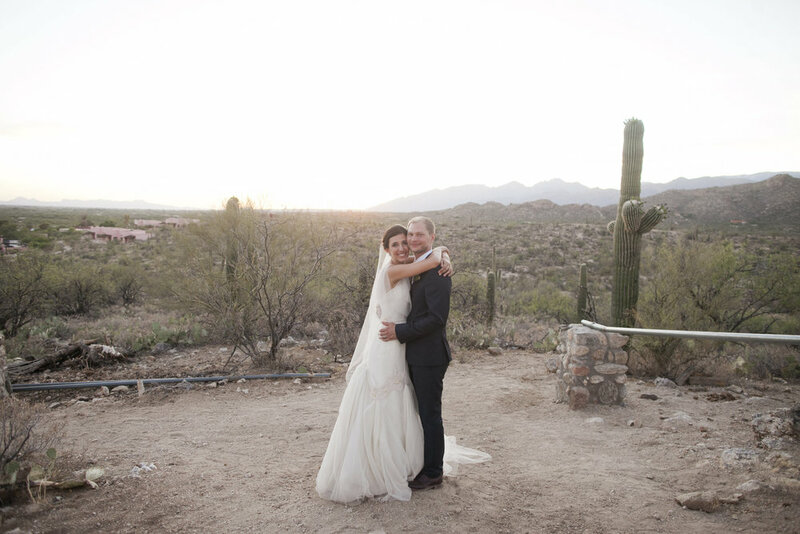 Ceci Bride Anja chose the dusty desert of Tucson, Arizona to exchange vows with her now husband, Ben at the Tanque Verde Guest Ranch. 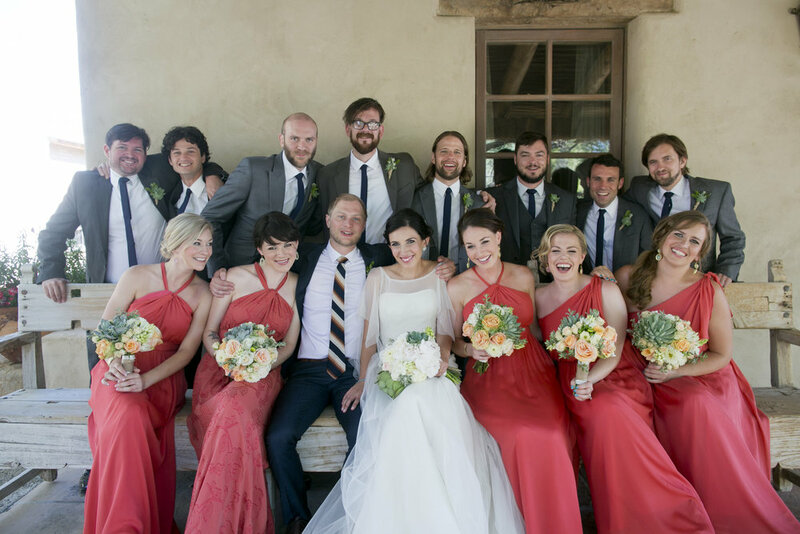 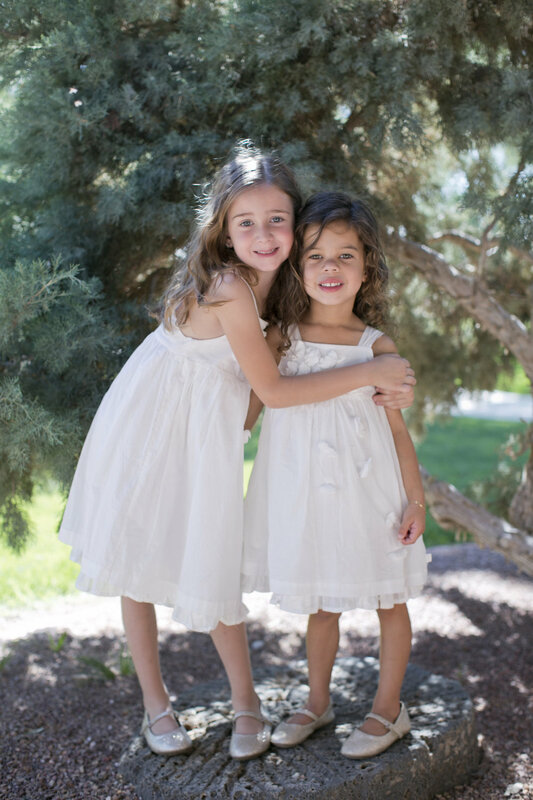 Anja called her talented friends and peers (we were so honored to be included!) 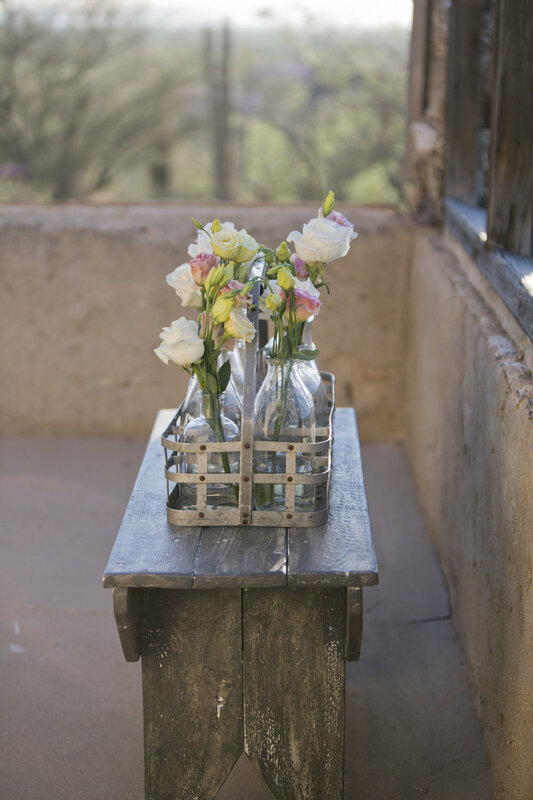 to bring her vision to life. 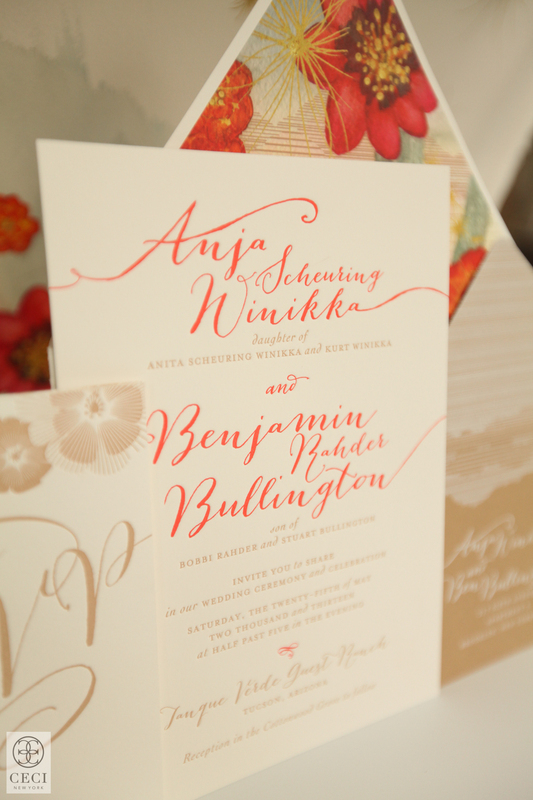 We set the tone for Anya's chic wedding with a sandy tan and coral letterpress printed invitation suite featuring stylized typography on a thick white stock. 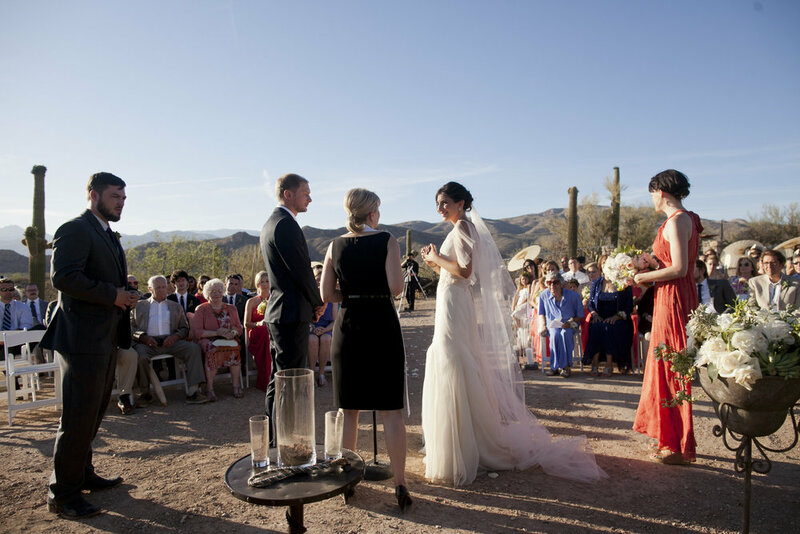 But, it was the commissioned watercolor painting by Ceci Johnson that served up the wow factor and introduced her guests to the the locale, the energy and, of course, the gorgeous color palette stolen from a desert sunset. 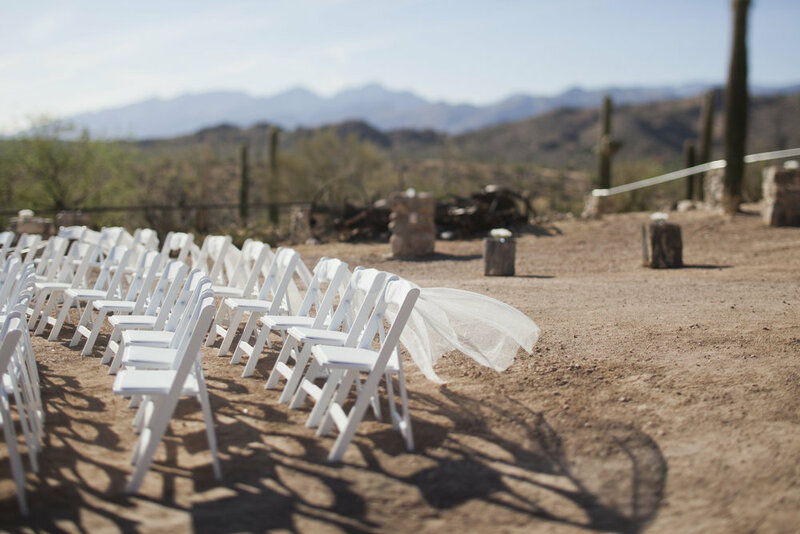 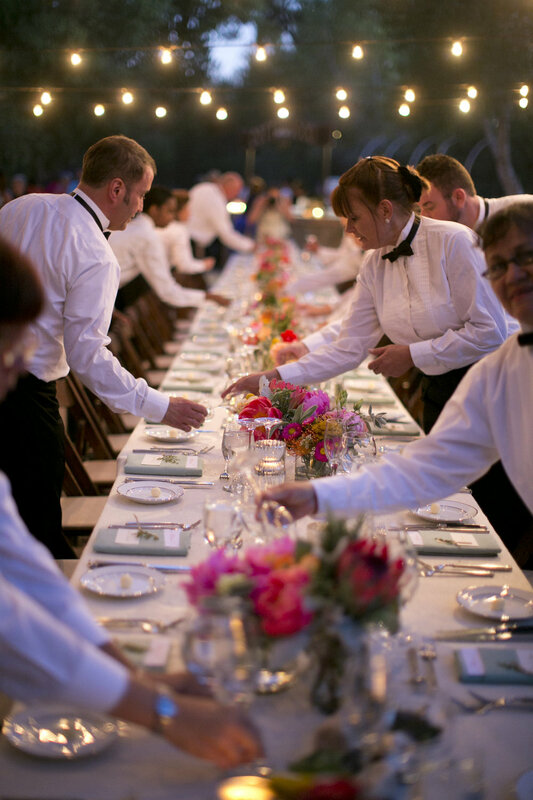 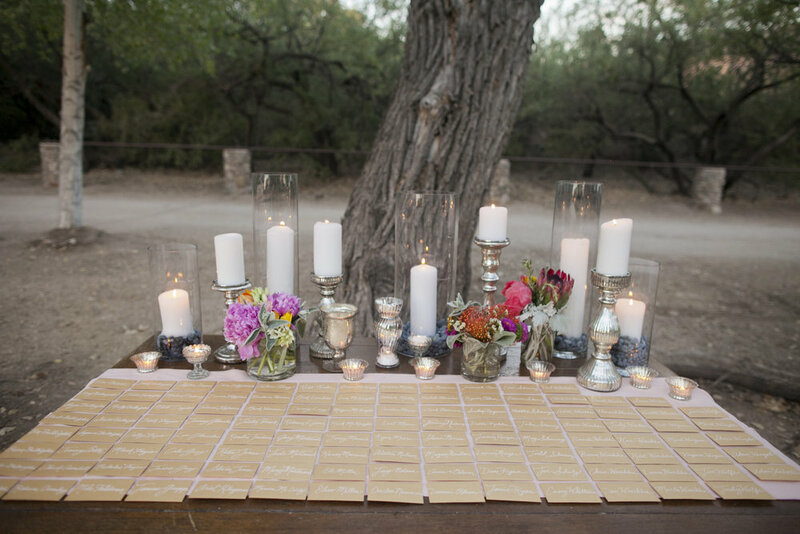 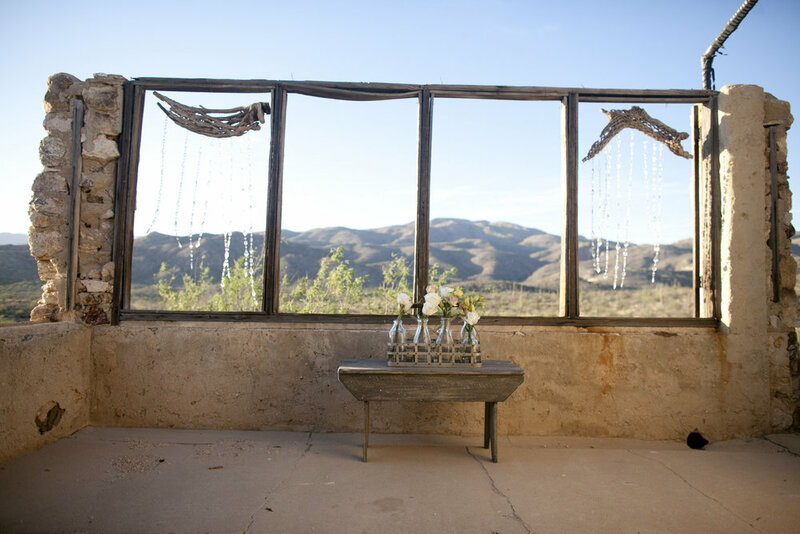 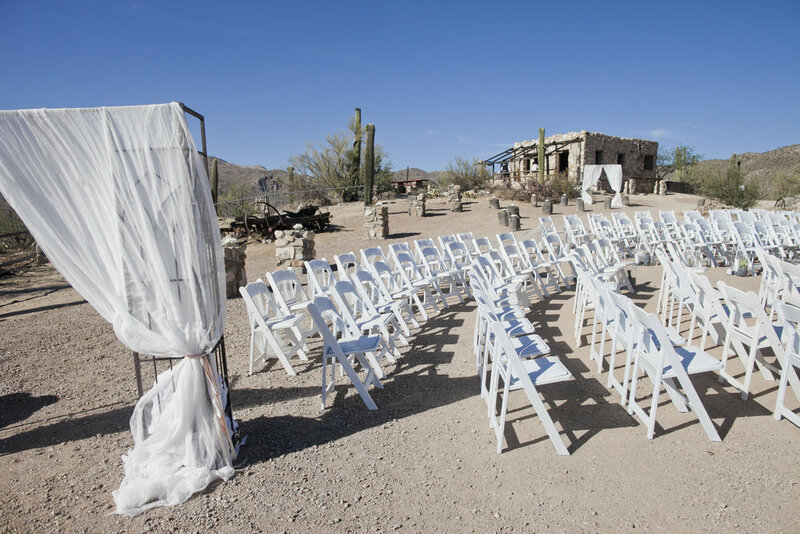 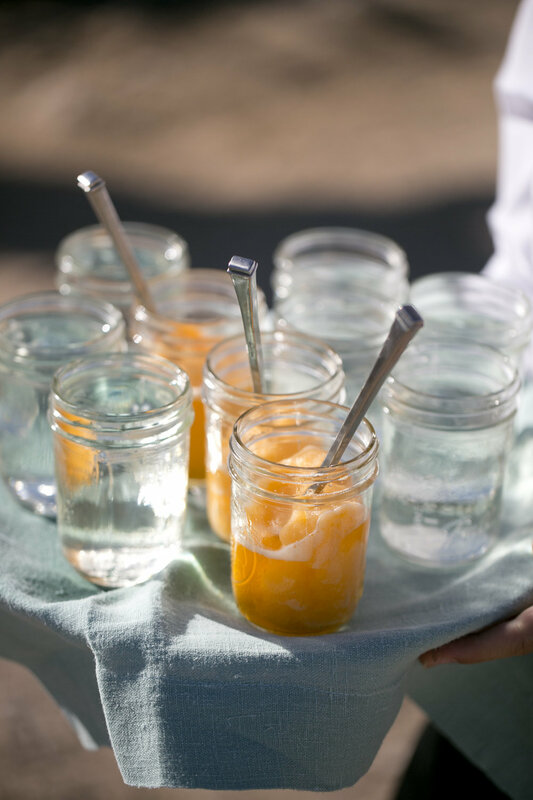 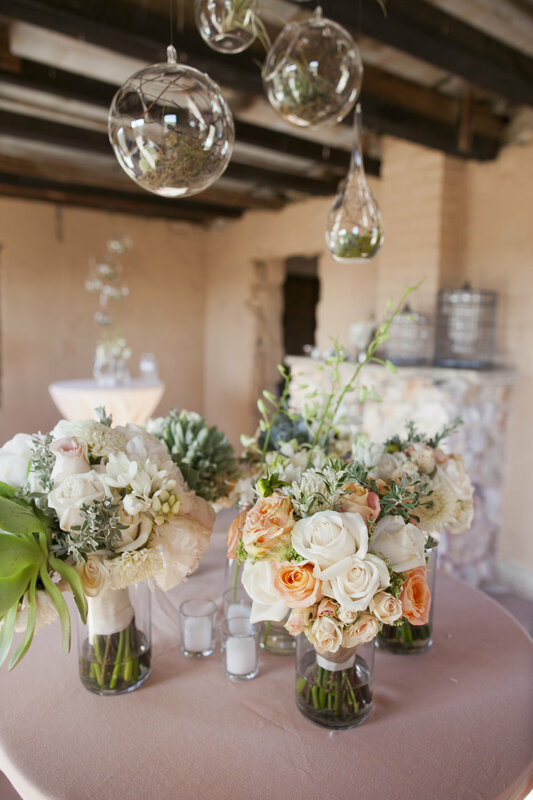 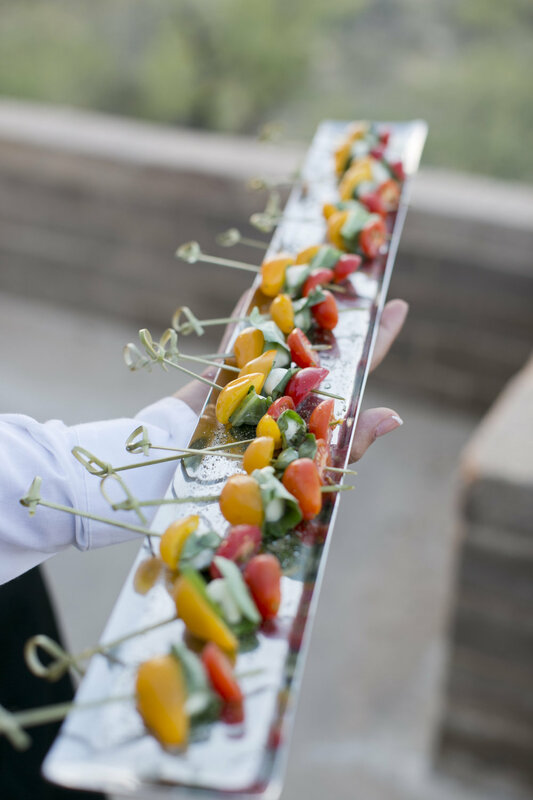 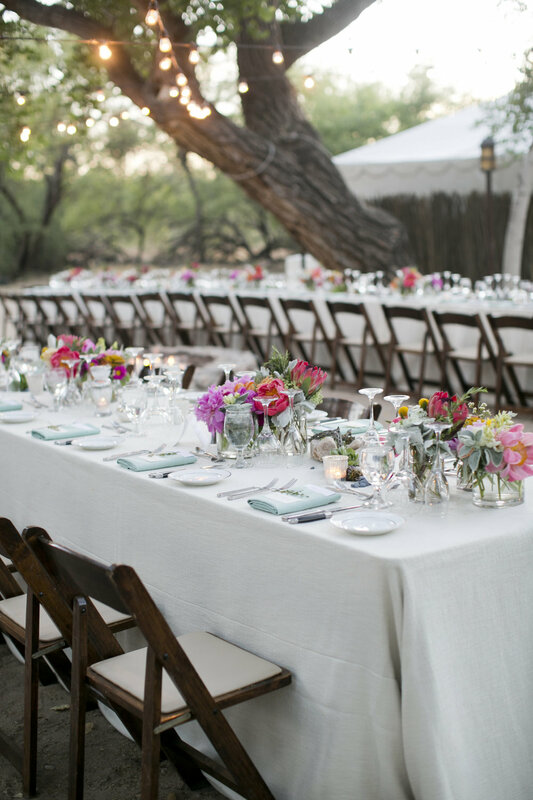 Her planner, Laura Wright of Rock Paper Scissor Events, orchestrated the beautiful yet relaxed affair and really worked the desert landscape. 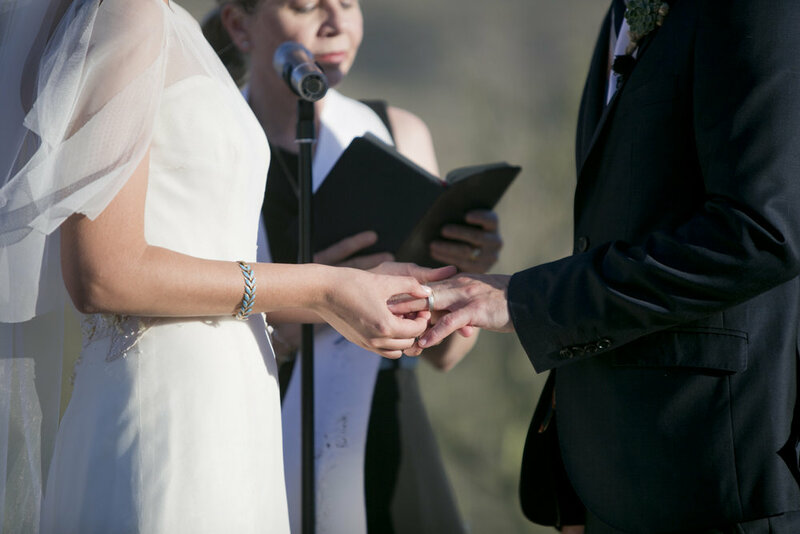 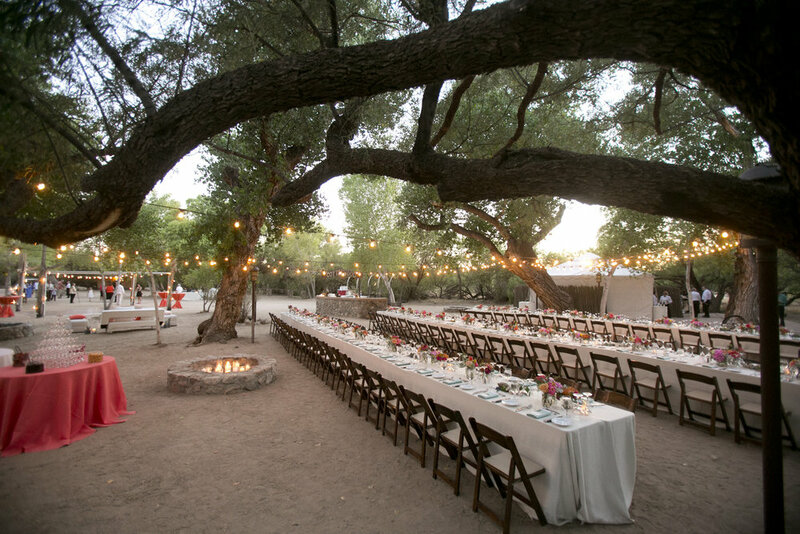 The ceremony took place at sunset and the reception was located a cozy cottonwood grove surrounded by trees, a truly magical spot in the middle of the desert. 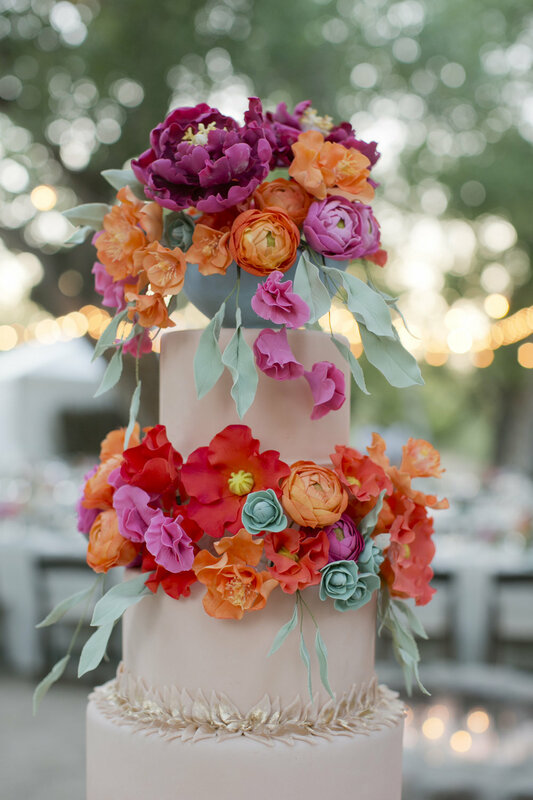 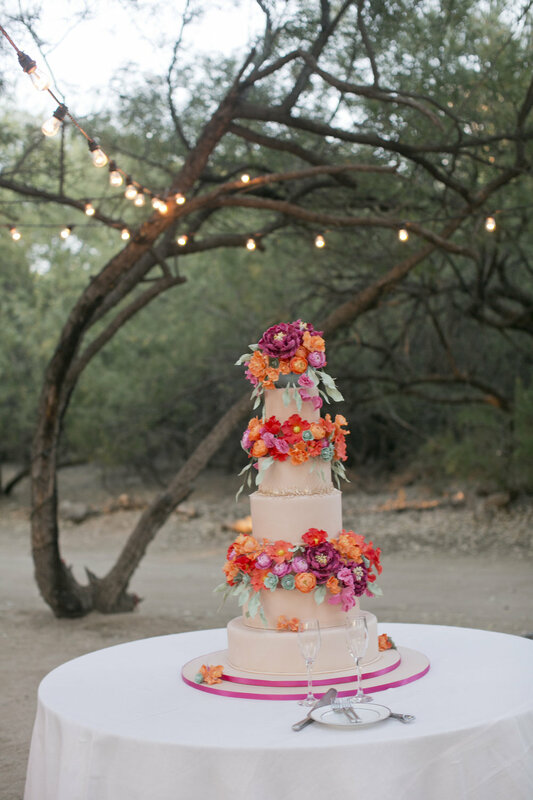 Even the wedding cake by Ana Parzych Custom Cakes took a cue from Anja's Ceci New York invitations and highlighted this special venue with it's desert colored fondant and bright, bold sugar flowers. 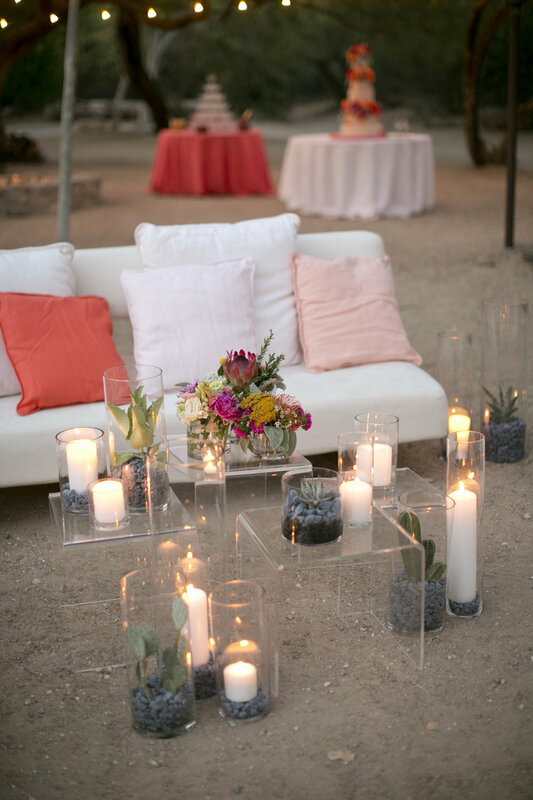 Then, making guests feel right at home was Laura's use of comfortable lounge furniture and soft pillows in a range of hues. 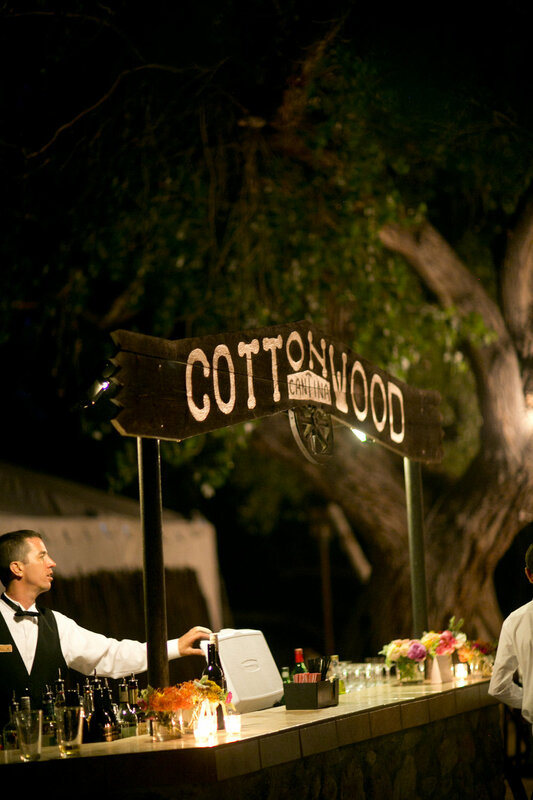 Once the sun set (which is always a sight to see in the Southwest) the party kicked into high gear. 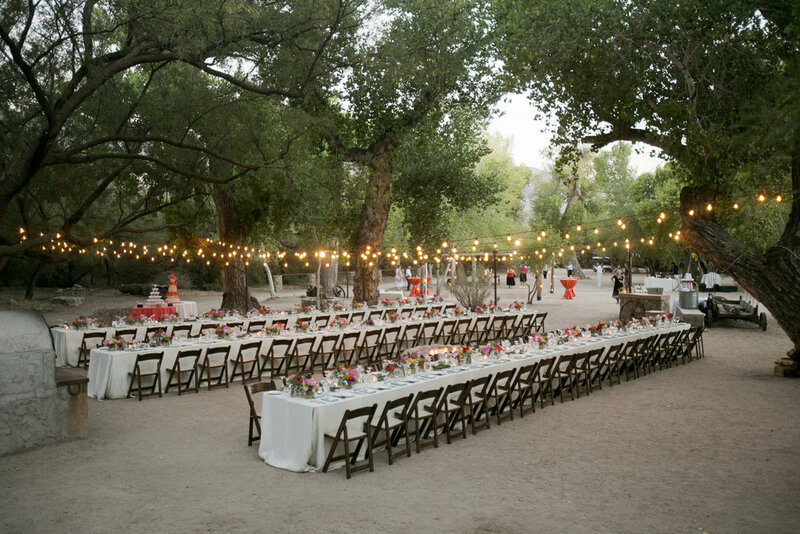 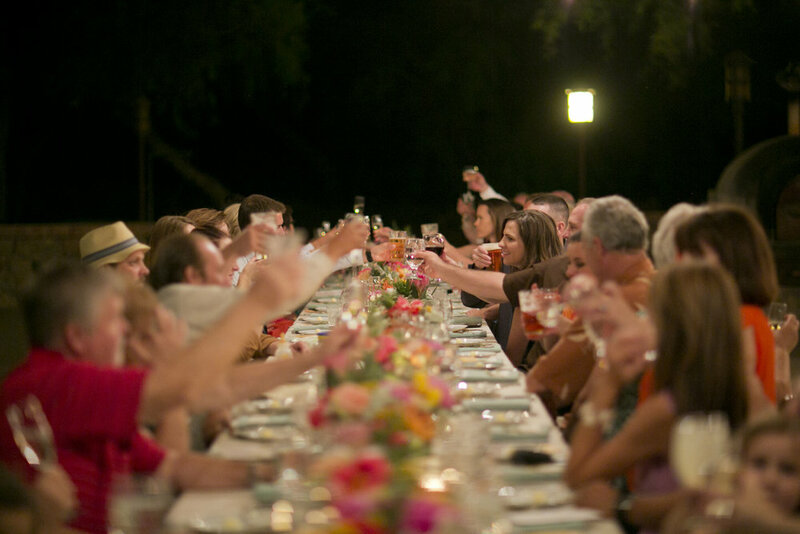 Underneath the romantic string lights and surrounded by friends and family, Anja and Ben ate, danced and drank the night away - truly an oasis in the desert. 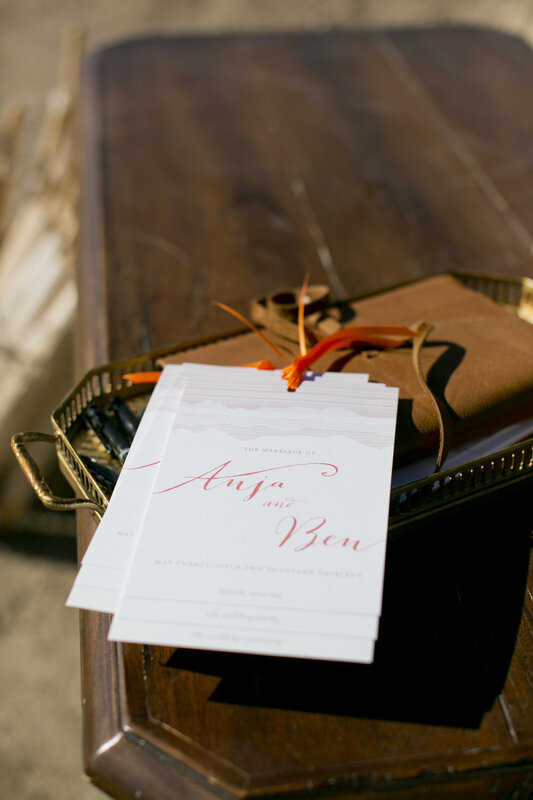 Photography: Mel Barlow + Allan Zepeda / Mel Barlow & Co.